Commercial curbside recycling collection is available to businesses and multi-family units (5+ units) in our service area. Why does SSC use the Stack 3 Recycling Bin "Pre-Sorted" System? Service Area: Bellingham, Ferndale, Birch Bay, Blaine and the majority of unincorporated Whatcom County. Looking for an interior recycling bin system? Take a look at what Clean River has to offer or search the web for Commercial Recycling Bin Systems for other options. Do you want to reduce waste, recycle more, and save money? Contact Recycling Manager, Rodd Pemble rodd@ssc-inc.com to schedule an on-site waste audit and recycling assessment of your business or condo/apartment complex. Stack 3 Recycling Bins not available to Multi-Family (5+) customers. Extra Charges: Extra charges apply on overweight containers. Extra charges also apply for garbage piled on top of, or beside, containers. Note: SSC supplied containers are the property of SSC. Please label them with your address. DO NOT take them with you if you move. Customers are responsible for any theft, loss or damage in excess of normal use of SSC containers. A replacement fee will be charged for lost or stolen SSC containers. 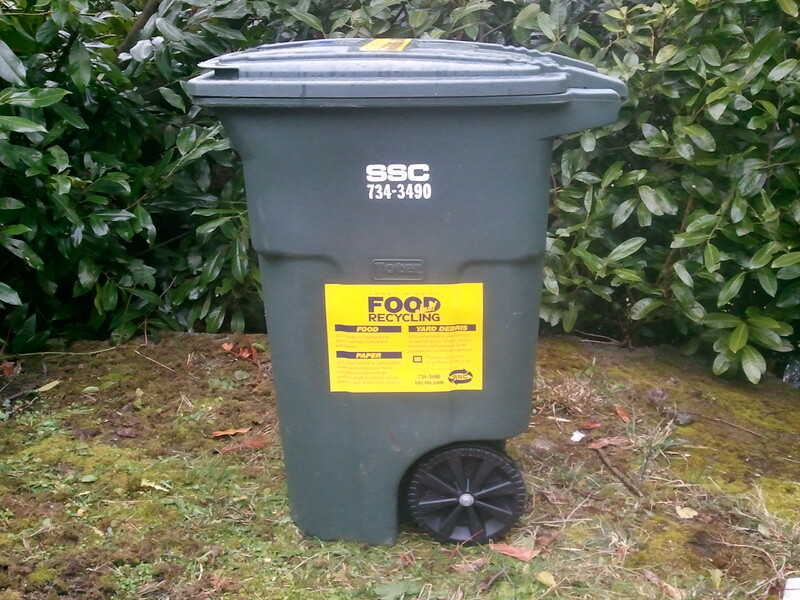 SSC is not responsible for items left in, on, or near garbage Toters® or garbage cans. Live or work in outlying areas? SSC supports the efforts of Western Wildlife Outreach. Check out these garbage and recycling storage tips. Collection: Please set out containers the evening before your collection day. SSC crews works all holidays that fall on weekdays. Please set out collection containers as usual. Click here for holiday collection schedule tips. Please place each bin on the ground on windy days. Do not stack. For more windy weather tips, click here. Weather-related Service Delays: Collections may be missed due to weather or road conditions. Click here for weather-related service info. If missed garbage and recyclables are collected on your next regularly scheduled pick-up, no credit will be given. For schedule changes or service interruptions, click here or contact us during office hours or (360) 734-3490 for instructions. Our offices are open Monday-Friday 8AM-5PM. Closed most major holidays. Collection Schedules: To request a collection calendar, click here, contact us or call (360) 734-3490. New Customer? To start service, click here, contact us or call (360) 734-3490. Start / Stop Service: To start or stop service(s) on an existing account, login to your online account or contact us or (360) 734-3490. Rates: For rates, please contact us or (360) 734-3490. Why are rates not listed online? Multi-Family Property Manager Note: The flat recycling rate in the base collection rate = unlimited recycling. The more your tenants recycle, the lower your bill. How? Downsize your garbage container, request additional recycling Toters® at no additional charge and pay LESS for MORE service! To request extra recycling containers, please contact us. Planning an event? Visit our event services page for more info on temporary service at your event. Pay your bill, order a new service or change existing service, update your contact info, sign up for paperless e-statements and more with our online account management system. Click here to sign up. You will need to create a user name and password and will want your most recent SSC bill handy which lists your account number and invoice number. Collection schedules are available on your online account. To request a collection calendar, please contact us. Toter® wheeled, rollable containers with handle and lid. For enclosure guidelines and info click here. For questions, please contact us. Gate Service (Option) — Available for a small charge. If locked, customer must unlock or supply a standard SSC dumpster lock. Purchase lock from Accurate Lock & Security, Inc. or Security Solutions (formerly Bellingham Lock & Safe). Pack Out Service (Option) — Available for customers whose containers must be moved more than 5 feet to reach collection truck. SSC driver takes container to truck, empties it and returns it to designated storage location. Small charge per pick-up on containers 4-yd and smaller (note: there are no wheels on 6-yd and up). Due to weight, most restaurants cannot have Pack Out Service over 2-yd. Contact us for rates or more info. 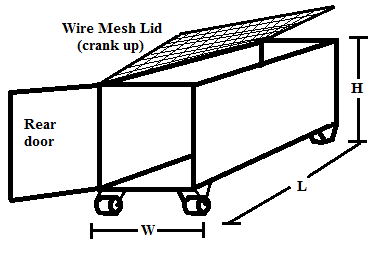 Metal cages with option for side slot and top loading. All sizes are approximate. For enclosure guidelines and info click here. For additional questions please contact us. Gate Service (Option) — Available for a small charge. If locked, customer must unlock or supply a standard SSC dumpster lock. Purchase lock from Accurate Lock & Security, Inc . or Security Solutions (formerly Bellingham Lock mp; Safe). Wheels (Option) — Available on containers up to 4-yd in size. Lock Bars (Option) — Available upon request for any size container. 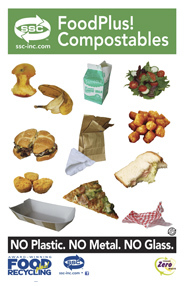 For info on how to prepare cardboard for recycling click here. Wax-coated Cardboard: Small quantities accepted flattened, loose. $0.25/box (based on weight of ~6.5lbs/box). To sign up for service, please contact us. All sizes are approximate. For enclosure guidelines and info click here. For additional questions please contact us. Wheels (Option)—Available on containers up to 4-yd in size. Lock Bars (Option)—Available upon request for any size container. 6-yd (cathedral roof) 80" 68" 71"
8-yd (cathedral roof) 80" 73" 86"
Gate Service (Option)—Available for a small charge. If locked, customer must unlock or supply a standard SSC dumpster lock. Purchase lock from Accurate Lock & Security, Inc. or Security Solutions (formerly Bellingham Lock & Safe). SSC appreciates the opportunity to provide your facility with garbage and recycling service. To better serve you, we have provided information concerning enclosures and container space requirements. This info is intended as a starting point for architects and designers working on your project. National safety standards require a hard, level surface for all solid waste and recycling containers. Please site containers in a well-lit, unobstructed area as close to the street or alley entrance as possible. Areas which are not level or obstructed may not receive proper service. 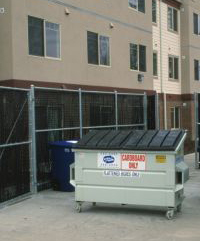 Commercial and multi-family solid waste and recycling areas, regardless of size or type of service, should refer to the Enclosure Guidelines (PDF). To schedule an on-site visit or to discuss your site’s specific needs and limitations, contact SSC Recycling Manager, Rodd Pemble, rodd@ssc-inc.com or (360) 734-3490. Recyclables are sold and the value we receive (if any) from the sale of these materials is applied to your collection bill in the form of a commodity credit or debit. The commodity credit or commodity debit that appears on your bill reflects market conditions of the previous six months. Market prices for recyclables go up and down just like prices for other commodities, such as lumber and gasoline. Following a period of high (or positive) market values, your commodity credit will increase, but still may be a debit depending on market conditions. Following a year of low (or negative) market values, your commodity credit will decrease and may become a debit. The sale of these recyclables helps lower your overall bill. 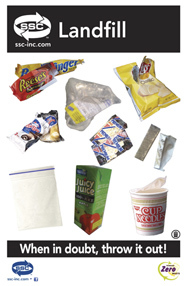 In years when we pay to have your recyclables processed, please remember it is still less expensive than disposing of these materials as garbage. We encourage you to continue recycling! The commodity credit or commodity debit is reviewed and adjusted by the Washington Utilities and Transportation Commission (UTC). The UTC reviews and approves our rates (except for residents in the cities of Bellingham and Ferndale) to ensure you are paying a fair price for the service you receive and fair value for your recyclables. *Multi-Family accounts are billed every three months. You can help keep your bill low by recycling as much as possible and buying products made from recycled materials. Increasing demand for products made from recycled materials helps strengthen recycling markets. By recycling, you also reduce the amount of garbage you generate and help conserve valuable resources. 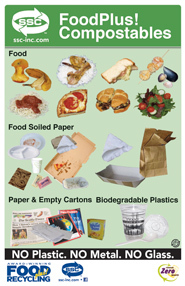 Recycle the following materials by placing them in the marked recycling bins or recycling Toters®. Max. 35 lbs. per recycling bin. Additional recycling bins are available for purchase. Order here. For extra large quantities of home business-generated materials, please contact us or call (360) 734-3490 for service options. Drivers cannot take recyclables in plastic bags for safety reason - use a small plastic tub or cardboard box no larger than a standard curbside bin for extras. Windy out? Click here for tips on preventing wind-blown litter. Thank you for helping us keep your neighborhood clean! 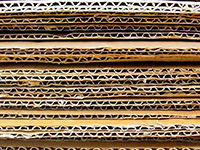 Reminder: Stack corrugated cardboard next to bins or Toters® for recycling. 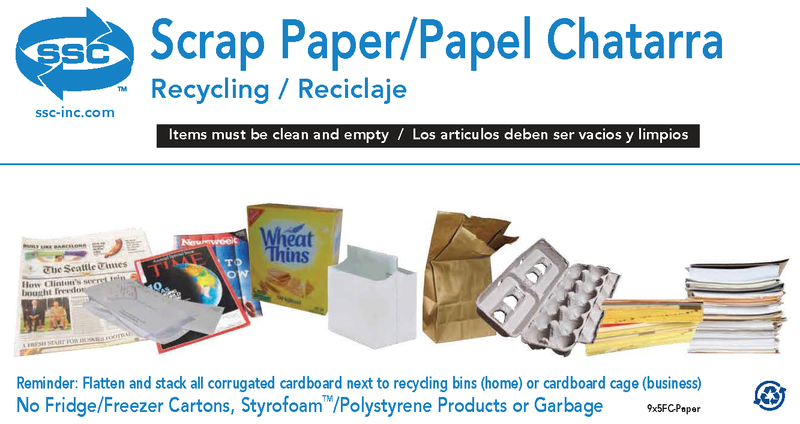 Reminder: Remove packing material from and stack flattened corrugated cardboard next to bins or TotersÂ® for recycling. Place shredded paper in a paper bag and tape shut. Envelopes, stationery, labels, paper sacks, phone books, paperback books, textbooks, manuals and guides. Note: remove and discard covers and bindings of hardback books. Paperboard cartons (ex. Cereal boxes, mac n' cheese boxes, shoe boxes, gift boxes, egg cartons). Discard liners/packing material. Flatten. Polycoated cartons or boxes (refrigerator/freezer) ex. milk, juice or frozen food containers. Click here to download a printable scrap paper decal! Yes: Clean newsprint, inserts, ads, masking paper and masking tape. Roll or fold masking paper up tight. NO plastic or strapping tape. If windy, please put top layer of newspaper in a paper bag to prevent litter. Click here to download a printable newspaper decal! Overfull recycling bins? Moderate quantities of extra materials can be placed next to recycling bins in an open cardboard box or plastic container (basket, bucket, etc.) no larger than your SSC curbside recycling bins. Additional recycling bins are available for purchase. Order here. For extra aluminum and plastic containers ONLY, you may also purchase a 30-32 gallon lightweight, plastic can (see examples to right) and label it Aluminum and Plastic Containers. Drill several holes in the bottom of the plastic can for drainage. Cans with water in them may not be able to be emptied for safety reasons. If your can is not collected for safety reasons, please drain any liquid and place out for collection on your next regularly scheduled pick-up day. Use your recycling bin to recycle glass bottles and metal cans. Glass Bottles and Jars. All colors. Labels & caps/lids OK. Throw away plastic corks; compost real corks. Remove caps/lids. Rinse bottles and jars clean. Bottles must be removed from 6-pak and 1/2 case boxes, etc. and placed loose in bin or Toter®. Avoid breaking glass. Chipped or cracked OK. For broken/shattered glass, bag or place inside an empty carton (milk/juice) or box and discard in garbage. Aluminum Cans, Tin Cans and Foil. Remove tin can labels and recycle with scrap paper. Rinse all cans and foil clean. FLATTEN. License Plates - Remove or invalidate the month and year tabs then bend the plates so they can't be used on another vehicle. Recycle old license plates, except those listed below, with bottles, cans and plastic containers or at one of our Recycling Centers. 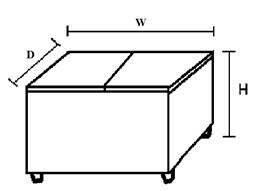 We cannot accept the following types of plates. Please return to a vehicle licensing office. For more info click here. Aerosol Cans (recycle with scrap metal - see below). Non-hazardous, aerosol cans ONLY. Aerosol cans must be EMPTY - no pressure or contents left in can. Leave cap on (if you have it). Place in a cardboard box with any other scrap metal. 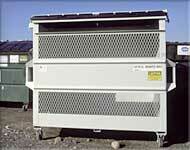 Set next to recycling bins or recycling Toters® for collection. Hazardous product aerosol cans or cans that are not empty must be taken to Disposal of Toxics for safe disposal. For more info call (360) 380-4640 or visit www.whatcomcounty.us/833/Disposal-of-Toxics-Facility. Bottles, Jugs, Caps & Rings. (max. bucket size - 3 gal. with metal handles removed) All colors and numbers. Labels OK. Put caps/lids back on all plastic bottles before recycling. Rinse CLEAN and recycle loose or nested together. FLATTEN bottles - especially bottles half-gallon size or larger. Beverages, dairy products, deli foods, sauces/condiments, cooking oils, soaps, detergents, cleaners (kitchen, laundry & garage), snack foods, frozen foods, storage/freezer-type containers, hair/body care, health/medicine, single-serve cold beverage cups/lids, hot beverage lids, caps and rings. Flattening bottles saves room in your recycling bin and on our recycling truck - allowing us to collect more recyclables and make fewer trips to the recycling center. This conserves fuel, saves time and money and reduces our impact on the environment. Thank you for your cooperation. 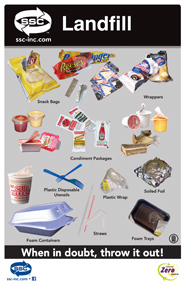 Plastic containers that held potentially hazardous products such as motor oil, antifreeze, paints, pesticides, etc. Styrofoam™: Click here or inquire with local postal, mailing and shipping outlets for reuse options. To recycle larger quantities or other materials please contact us ssc@ssc-inc.com. NOTE: Buckets larger than 3-gal, as well as plant pots, trays, and other miscellaneous rigid plastics stamped with a resin number 1-7 inside a chasing arrows logo can be recycled at our downtown Drop Box Facility & Recycling Station, 1001 Roeder Avenue, M-F, 8am-5pm. Fee charged: $5/30-gallon bag of mixed plastics. Generate larger amounts of plastics? Call 360-734-3490 or contact us to arrange for commercial pick-up. Why do materials need to be clean for recycling? Additional Plastics (pots, trays, bags, tarps and more) accepted for DROP-OFF RECYCLING ONLY at Bellingham Drop Box Facility & Recycling Center. Click here for more info. Recycle these materials by placing them neatly next to recycling bins. Rechargeable Batteries - Ni-Cad, NiMh, Lithium and those used for cell phones, cameras, hearing aids, rechargeable tools, etc. Please contact Disposal of Toxics for recycling or disposal options. Scrap Metal - Steel, copper, aluminum, brass and aerosol cans. Maximum 35 lbs. per pick up. Maximum length 24 inches. Store in a box or bag. No plastic pipe. Cords, Wiring and Holiday Lights - Please coil/bundle and tie with string, rubber band or twist tie and place next to recycling bins for pick-up. Aerosol Cans - Non-hazardous, aerosol cans ONLY. Aerosol cans must be EMPTY - no pressure or contents left in can. Leave cap on (if you have it). Place in a cardboard box with any other scrap metal. Set next to recycling bins or recycling Toters® for collection. Hazardous product aerosol cans or cans that are not empty must be taken to Disposal of Toxics for safe disposal. For more info call (360) 380-4640 or visit www.whatcomcounty.us/833/Disposal-of-Toxics-Facility. Corrugated cardboard and brown paper bags. Remove packing materials. Flatten and bundle. No Styrofoam™, plastic packing or wax-coated boxes. Wax-coated Cardboard: Small quantities accepted flattened, loose. $0.25/box (based on weight of ~6.5lbs/box). Variety of sizes and options available. Click here for details. Download printable decals and posters for use in your business. Food scraps, yard debris, compostable papers and bio-plastics are all composted into rich soil amendment through our award-winning FoodPlus! program. FoodPlus! is a cost-effective way to reduce waste, trim your garbage bill and support local businesses creating new products from recycled materials. All FoodPlus! materials are composted at Green Earth Technologies (GET) in Lynden. Compost from GET is available for sale in Whatcom County. Service Area: Bellingham, Ferndale, Birch Bay, Blaine and parts of unincorporated Whatcom County. Currently, there is no FoodPlus! service on Lummi Island. Wheeled container, handle, lid Weekly, Every-other-week Max. wt. 100 lbs. Order Foodplus! service here. Note: FoodPlus! is also available to residential customers. *Or use your own container(s), paper bags or boxes for extra material. NO PLASTIC BAGS PLEASE. Set extra materials next to FoodPlus! Toter® for pick-up. Charges for extra materials apply. Bulky Items: Bulky material that will not fit in Toters® should be cut to 4’ lengths, tied in bundles (max. weight 50 lbs.) and set next to Toter®. Charges for bulky material apply. Please contact us for questions. Woody Debris: For larger amounts of yard waste and/or woody debris like branches, brush more than 4’ long (max. 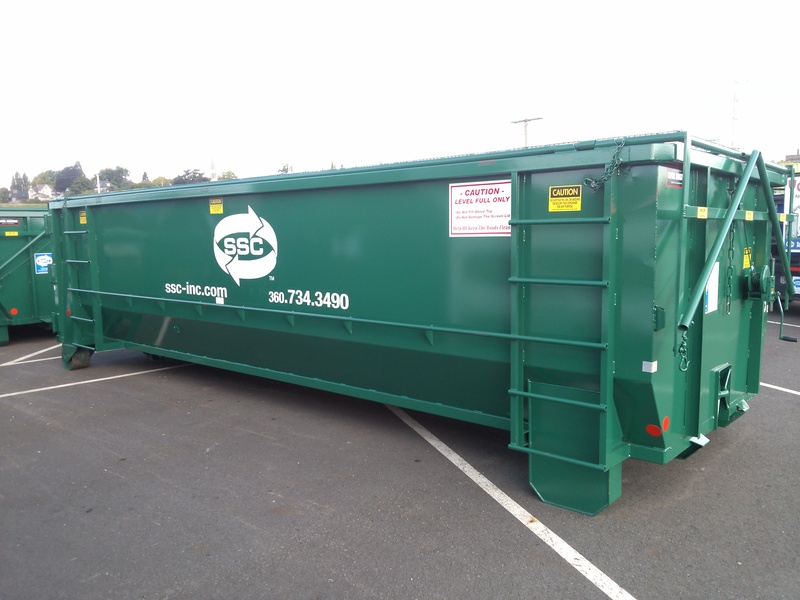 7” diameter and 20’ long), check out our dumpster and drop box rental options (1-40 yard) or contact us for service options. Collection: Please set out containers the evening before your collection day. SSC crews works all holidays that fall on weekdays. Please set out collection containers as usual. Click here for holiday collection schedule tips. Collections may be missed due to weather or road conditions. Click here for weather-related service tips. If garbage and recyclables are collected on your next regularly scheduled pick-up, no credit will be given. For schedule changes or service interruptions, click here or contact us during office hours at ssc@ssc-inc.com or (360) 734-3490 for instructions. Our offices are open Monday-Friday 8AM-5PM. Closed most major holidays. SSC supports the efforts of the Grizzly Bear Outreach Project. If you live or work in outlying areas, check out these garbage and recycling storage tips. Note: SSC supplied containers are the property of SSC. Please label them with your address. DO NOT take them with you if you move. Customers are responsible for any theft, loss or damage in excess of normal use of SSC containers. A replacement fee will be charged for lost or stolen SSC containers. 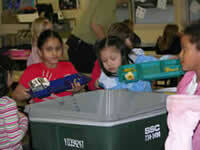 SSC is not responsible for items left in, on, or near Toters® or garbage cans. Pack Out Service: Ideal for weekend residents, those in neighborhoods where covenants prohibit leaving garbage and recycling containers out overnight or for customers who need assistance. SSC driver takes container to truck, empties it and returns it to its designated storage location at your home. Available to all customers for a small charge per pick-up. Toter Cleaning: $10.50/Toter™ (subject to change without notice). Call 360-734-3490 or email us for current pricing and to schedule a Toter swap. Note: Five (5) days notice required for scheduling. Rates: For rates, please contact us or (360) 734-3490. For tips and more info visit our FAQ page. All Meat, Fish, Shellfish Scraps (including bones and shells). No roadkill. Compostable Dishes/Utensils/To-Go Containers (Ex. Corn, Potato, Bamboo) Note: MUST say compostable. Biodegradable NOT accepted. *Wax-coated Cardboard: Small quantities accepted flattened, loose. $0.25/box (based on weight of ~6.5lbs/box). Dumpster Service: Charge per box. Contact Us for more info and rates. Planning an event? Visit our event services page for more info on using FoodPlus! at your event..
Food to Flowers! is the elementary school version of our award-winning FoodPlus! service. Launched in 2006 as a pilot at three schools in Bellingham, Food to Flowers! is currently operating in all elementary schools in the Bellingham School District plus schools in the Ferndale, Mt. Baker, Meridian and Lummi school districts and a number of private schools throughout Whatcom County. The program is modeled after the Food to Flowers! program in San Francisco. For more info or to get your school involved, click here. SSC - your partner in building green! We offer a complete line of jobsite services including construction/demolition recycling and woody debris recycling, standard recycling and garbage collection, FoodPlus! service, portable toilet / sink rentals and portable storage box rentals. Containers: Drop boxes from 15-40 yard available. Details here. Collection Schedules: On-call or scheduled service available. Contact us to schedule service. Rates: For rates, please contact us or call (360) 734-3490. Tax: depending on where your construction/demo recyclables are accepted, a recycling tax of 3% may be imposed. Otherwise there is no tax on recycling services. Rent: charged daily or monthly depending on length of service. Hauling: Haul time (min charge 1 hour) from jobsite to recycling facility. No delivery charge on permanent container rentals (>90 days). Delivery charge applies to all temp container rentals. Source Separated Recycling Credit/Debit: If the recycled material has a positive value, you receive credit applied to your account. If the recycled material has a negative value, you are charged accordingly for the materials. Note: In almost all cases, even if there is a charge, costs to recycle are still less than disposal costs. Note: Due to market forces outside our control, Scrap wood is now considered garbage. Until further notice, if a load is more than 20% scrap wood, the entire box will be charged at the current garbage rate. We are exploring other wood recycling options. *Scrap Wood is now considered garbage. 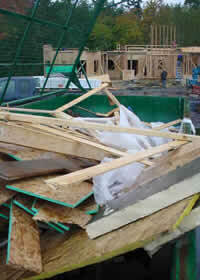 If a load is more than 20% scrap wood, the entire box will be charge at the current garbage rate. Source Separated Recycling (Single material): Sort and recycle separately for best value. Large quantities of single items like concrete/brick/asphalt, scrap metal, plastics, cardboard, etc. accepted. Contact us for options. WOODY DEBRIS No dirt, rocks or rootballs. Sutainable Connections' Green Building & Smart Growth Program. 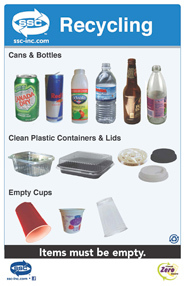 Routed commercial recycling collection and drop-off option available for a variety of plastics. See our Construction Recycling service for info about recycling plastics along with other construction related materials. Containers: All dumpster and drop box sizes available. Compactor option available charged at standard compactor recycling rates for film or rigid plastics. Collection Frequency: Monthly, first Thursday. On-call service also available. Rates: Contact us for more info. DROP-OFF RECYCLING ONLY - Bellingham Drop Box Facility & Recycling Center - 1001 Roeder Avenue (Corner F&Roeder). For hours and directions, click here. Rate: Small recycling fee charged for 30-gal or equivalent. Click here for more info on other materials accepted for drop-off or contact us with questions. All types and colors accepted. Material must be clean. Stuff into plastic sack to condense and save money. No Styrofoam or thin foam sheets. All colors, numbers, and sizes accepted. Material must be clean. Labels OK. 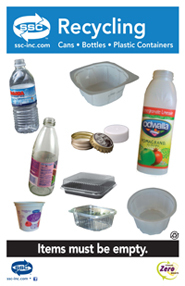 Remove lids and recycle loose or stuff inside containers. Stack and nest if possible to consolidate. Local grocery stores often offer plastic bag recycling bins. Bags must be clean and dry. Free. SSC does not accept any kind of hazardous, toxic, radioactive or dangerous waste(s), ammunition, explosives, roadkill/dead animals, old gasoline, solvents, antifreeze, asbestos, pesticides, oil-based paints or hot ashes. Note: Hot ashes are a fire hazard and should never be placed in a ToterÂ® or can. Set in a metal can outside and away from buildings, structures or anything that can ignite. Let cool completely. Place COLD ashes in a bag and dispose of as garbage. To dispose of ammunition or explosives (old boat flares, fireworks, etc. ), contact the Washington State Patrol (Bellingham office) at 360-676-2007 or the Bellingham Police Department at 360-778-8800 for options. To dispose of commercial hazardous wastes, please contact the Disposal of Toxics program at (360) 380-4640. Many electronic products - like computers, TV's and telephones - contain parts that can be harmful to the environment. These items don't belong in the garbage. Recycle old or non-working electronics instead. All SSC customers (except Lummi Island). Contact us at ssc@ssc-inc.com or (360) 734-3490 to schedule pick-up. All SSC customers. Contact us at ssc@ssc-inc.com or (360) 734-3490 to schedule pick-up. SSC’s Bellingham Drop Box Facility & Recycling Center – 1001 Roeder Ave (F&Roeder) – Public drop-off during regular business hours only (Monday – Friday 8AM – 5PM). Closed most major holidays. Check in at front for assistance. Cash, check, debit and major credit card accepted or charge it to your SSC account. All electronic items collected are delivered locally to Safe & Easy Recycling and responsibly recycled or reused. For questions or to schedule a pick-up contact us. Our mobile shredding service is available to both residential and commercial customers. Service is offered on a regular (weekly, every other week or monthly), occasional or as-needed schedule. From a small shoebox to a large storage unit - no amount is too big or too small. For on-site, mobile shredding at your location contact us at (360) 734-3490 or ssc@ssc-inc.com to schedule service. Drop-off option: Secure shredding available at our Bellingham Drop Box Facility & Recycling Center at 1001 Roeder Ave (F&Roeder). Hours here. Check in at office for instructions and to pay. 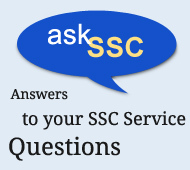 Cash, check, credit card accepted or charge it to your SSC account. Our mobile, state-of-the-art shredding truck shreds on-site while you watch. We provide a convenient and affordable way to protect yourself, your employees and your company from identity theft and confidently recycle your confidential data. Shredded paper is recycled through Northwest Recycling (NWR) - another locally-owned and family-operated business. Recycled paper is baled and shipped to mills regionally and overseas for manufacture into new paper products. 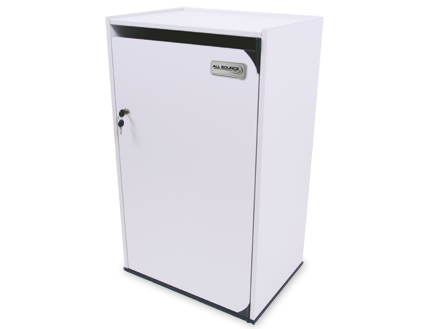 Dimensions: 24" x 20" x 40"
Capacity: Up to 100 lbs. Use your own storage box and reuse it. Staples, paper clips, fasteners and spiral notebooks OK. Please remove ringed binders from paper loads intended for recycling. All paper data is shredded and recycled. Other data is shredded and recycled as markets allow or destroyed and disposed. Where does it go? 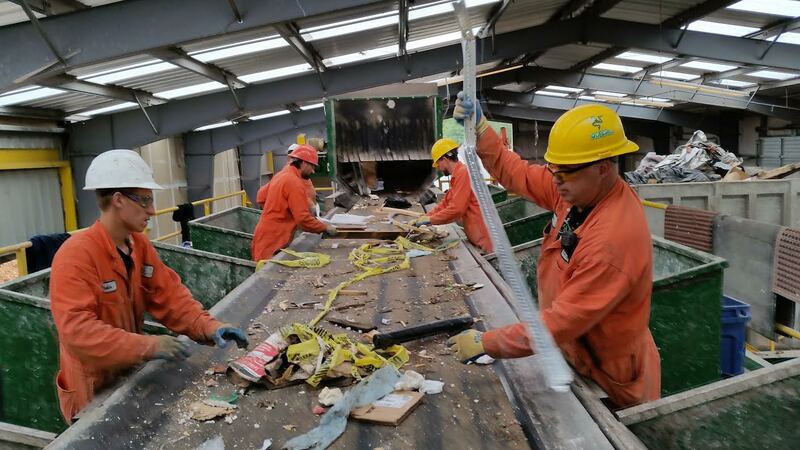 Shredded paper is recycled through Northwest Recycling (NWR) - another locally-owned and family-operated business. Paper is baled and shipped to mills regionally and overseas for manufacture into new paper products. All SSC shredding staff are given overviews of the HIPAA, Gramm /Leach/Bliley and Privacy Act regulations and are required to attend regular safety meetings for on-going training in equipment use and maintenance, safe route operations, DOT updates and discussion of other pertinent safety related issues. In addition, all employees are uniformed, professionally licensed drivers who are subject to extensive background checks and have signed a Confidentiality Agreement. A signed Certification of Destruction is provided upon request. Shredding service charges are included on your regular SSC bill - one bill saves you time and money. To set up an account or sign up for our auto-pay option, click here. 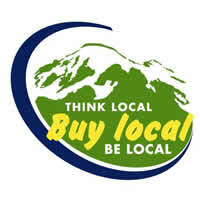 SSC is locally-owned and family-operated, and proud business member of the Better Business Bureau, Bellingham/Whatcom Chamber of Commerce and Industry and Sustainable Connections. All materials collected in the FoodPlus! Recycling program are composted at Green Earth Technologies (GET) in Lynden. Composting is a natural process that break down organic materials and turns them into rich soil amendment. Compost from GET is available for sale in Whatcom County.